Error with this page and it's not posting; checking with the moderators. Please check www.boraparts.com in the meantime. Last edited by BleachedBora; August 31st, 2009 at 10:53. 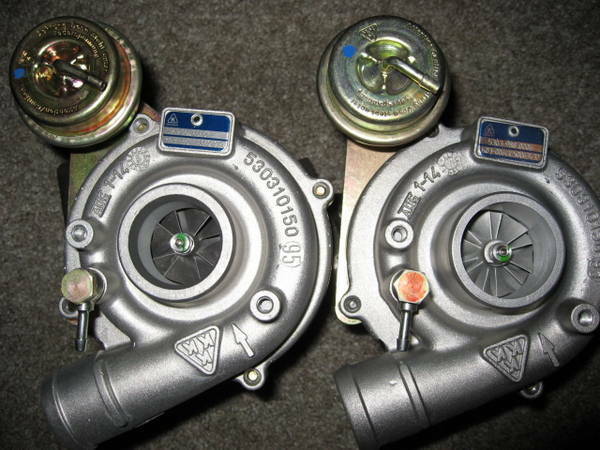 Last edited by BleachedBora; August 19th, 2009 at 14:55.
how long would I wait for a hybrid turbo for my 98 jetta AHU?? and would it work with sprint 520 and ups st2 chip?? any cons about the hybrid turbo??? I could ship one off tomorrow! A stock KKK-K03 is on the left, and a KKK-K03/K04 hybrid is on the right. 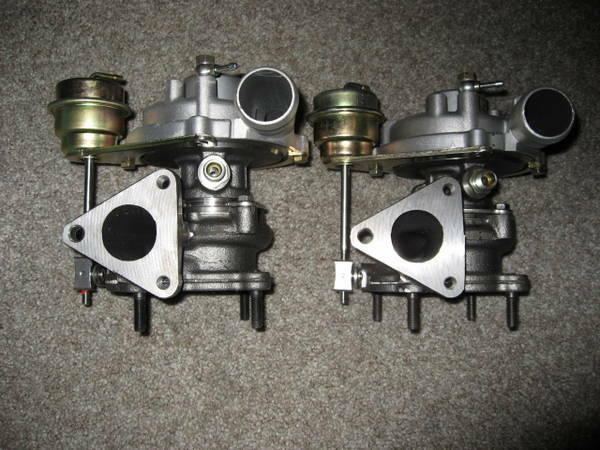 The housing is the same, but the wheel on the compressor side of the hybrid is from a K04 turbo--this allows more air to be pushed without increasing lag. Performace is great! ~50 degrees cooler, ~2 more MPG and more power! Hi - what's included in the A3 Timing belt kit (including manufacturer)? I second this question (B4) Need to change mine as it is past due. Never replaced anything since I had it, although I did just change the Inj pump last week, had to use the old belt. It includes everything that needs changing...however, if you have not changed out your water pump recently I'd recommend doing that as well. Aaron, arent you selling the Elf Excellium 4w40 now too? If so, how much is it? As for shipping, Bend is between SLC and TTD if you take the scenic route home for the holidays. But that would put me way back. I guess it depends on when that long block arrives. Can rent movies at BlockBuster. I have never heard of a 4w40--care to enlighten me? Ahhh.. typo. Should have been 5w40. So I can expect clucth parts via air drop? And did you fall asleep at the end of that post? Oops--appears that I did fall asleep at the end of that post--that's what happens when you get 4 hours of sleep a night and you need 8 to function! Should work out well, as long as my room and my dad's garage don't become a warehouse! Hi BB...I may be interested in a hybrid turbo for an AHU if you still have one...your description of it sounds like there are no negatives ...I'll be putting it on Christine, who has an UPS chip and will have UPS nozzles as soon as I get a head put on it...still on the fence about how to handle the head...local redo or ship one from someone that does a more performance-oriented redo that can make it a little more able to handle the upgrades. i don't really need any of this stuff right now, but it would be nice to have when i need it in the future. i haven't had time to look around. are the prices competitive or are they the same as somewhere else? can we wager? is shipping less through you or a company. smoked bumper and side markers, PP764, 18" flik arctics, mufflerectomy, race pipe, more to come! !